If the presidential general election were today, which of these candidates (declared and potential) would you vote for? Thinking about Labor Day... The minimum wage in California will increase to $10 an hour on Jan 1, 2016. How do you feel about that? Would you be willing to reduce your life expectancy by 10 years to become extremely attractive, very wealthy, powerful and famous? Which of these "religious labels" do you identify with most? Governor Brown has mandated drastic water restrictions. Are you aware of what you need to do to comply? Since Laguna is a world-class beach community, and it is also an “arts community,” what do locals think of first? Are we a beach community that has an art component? Or, is it the other way around? Thanks to John Thomas for the idea. As part of the reissue of the US currency, a woman will replace Alexander Hamilton’s image on the $10 bill. Who would be your first choice for the new bill? Imagine for a moment that you wake up tomorrow and could become a Laguna Beach City Councilmember. Would you be up for the job? It’s Festival Season! StuNews & Company is excited! How about you? Will you be attending our Festival Season this summer? Choose the response below that best tells us about your plans! Diane Armitage has told us about new restaurant openings here in town now and in the not-too-distant future in our Dining section [6/5]. Which of the following are you most excited about? Before making a phone call, do you rehearse what you are going to say? How would you rate the City Council’s efforts since November’s election? What If…Let’s say the City “finds” an unlimited sum of money to fund just one project…Which of these projects would you want to see completed? Last weekend was one of the busiest-ever for sports fans. If you were able to only watch one thing, which would you choose? The Beatles famously sang: “All You Need Is Love”. How many times in your life have you been, “...in love”? While at Tuesday’s Friendship Shelter event, the subject of homelessness obviously was discussed. An interesting question was raised - Do you know anyone who has been homeless? If you were offered free concert tickets to see one of the following current pop acts, which – if any – would you most like to see? None – I would just say no thank you! 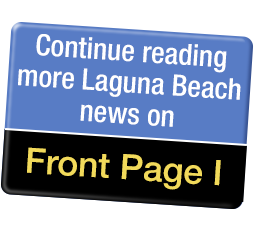 Laguna Beach has many charities and most have fundraisers in some form or another. Almost all rely on our donations to carry out their missions. How many Laguna Beach-based charitable fundraisers do you attend in a year? Our City’s free trolleys are up and running all year round on the weekends now! How often do you think you’ll hop on board and take advantage of them? If the world suddenly changed and you could no longer experience one of the following ‘arts’ for the rest of your life – which would you choose to lose?